Unique dog-friendly oceanview home - 800 feet from Proposal Rock! 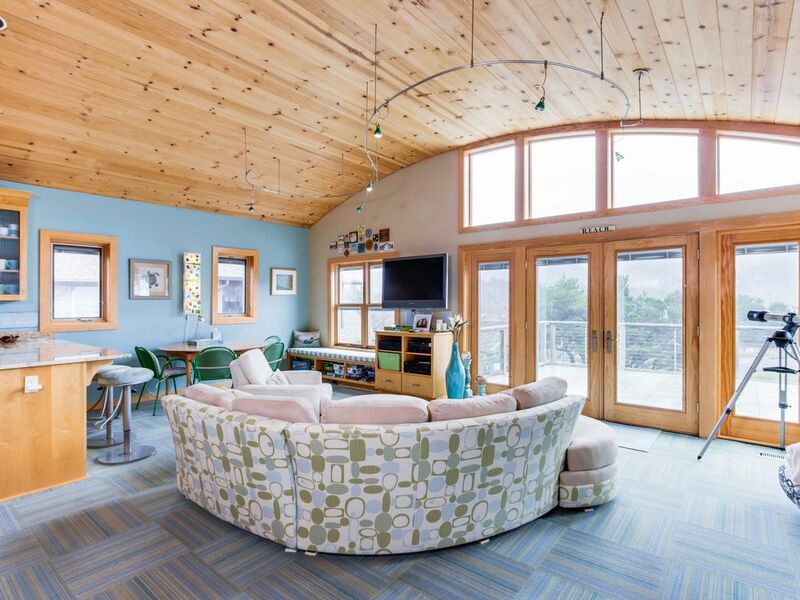 This unique ocean view home offers a world of entertainment for the kids and a relaxing environment for the adults! The house is set on a large lot on a dead end street so it is private but also convenient as it is one block from the beach access and a short walk to the Hawk Creek Cafe and the quaint town of Neskowin. When you enter the house you see the large kids room with two twin beds and a flat screen TV with a video game system. There are two additional twin mattresses that can be laid out on the floor in this room as well. There is an additional bedroom with a queen bed that is a great option for a second couple as well as a laundry room and full bathroom on this level. When you head upstairs to the upper level, you are greeted with a large open space with unique features from curved ceilings to a beautiful round dining table. The upper level has a gourmet kitchen that is perfect for the chef in the family! The master bedroom has a king bed and a workstation for those who need to work while they are away. There is a cozy side room with a fireplace that is the perfect place to read and relax next to a warm fire or to connect your favorite device to the free WiFi. The deck on the upper level is a great place to have a family picnic as there is a gas grill on the deck and you can cook the rest of the meal in the kitchen that is on the same level. The house has wonderful ocean views from the southwest corner of the deck. Neskowin is a quiet town with a small grocery store and the wonderful Hawk Street Cafe. There is also an art gallery in town and the Sitka Center nearby. Neskowin is also close to Lincoln City and Pacific City so you can find any convenience that you could desire within a short drive while enjoying the peace and quiet of a small town. We rented this house over the Easter weekend. Our family of four which includes two toddlers LOVED the house. Not only is the location perfect being a short walk to the beach,Hawk Creek Cafe and Market but the home is spectacular. A great layout, wonderful fully stocked kitchen, amazing deck, super clean, COMFORTABLE BEDS, washer/dryer, surround sound stereo/tv, views of both the river and the ocean and very quite. If you love Neskowin, this house will only add to your visit. I highly recommend it. This house had great extras from a loaded game bench for lots of family fun, to warm water outside to wash off the sand from our long beach explorations, the deck was so enjoyable to take in the breathtaking views morning and night! Neskowin is a wonderful little town not far from everywhere we wanted to visit on the coast, from the Yaquinta lighthouse to an awesome train ride to Rockaway. We would for sure stay here again if our family adventures take us back to Neskowin. Major Credit Cards Accepted. Taxes and fees are not included. Rates and availability calendars may change until time of booking. For a full rate quote and live availability, please contact us or visit the Vacasa.com website! A 10% down payment will secure a reservation that's more than 90 days away. respond immediately with the total cost. to get an exact quote and book online.